Resting beach side on a quiet avenue is one of the premier beach houses on Pawleys Island, SC. Sweet Breeze is now a second home its owners will enjoy for years to come. Situated to welcome beautiful vistas of ocean, beach and sky… and crafted to capture the carefree ambiance of Pawleys Island, SC. Created easy to care for and convenient to live in. Fine tuned to enhance everyday activities, family times, entertaining or just relaxing. Over 3100 square feet of heated living space on two levels—5 bedrooms and 5 ½ baths. All floored with antique heart pine or tile. Living revolves around the open great room – with kitchen, dining and den all looking out to the ocean through expansive windows. 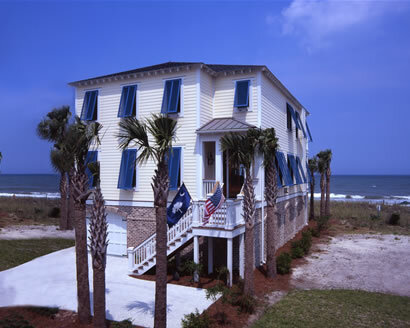 Three levels of outdoor decks front the ocean to call life outside to the beauty and pleasant climate of Pawleys. Two covered porches adjoin the living levels—and a spiral staircase leads up to a pergola, then higher to a widow’s walk. The beach is just a short walk directly from the lower porch down the private boardwalk. Quality amenities and luxury finishes abound in this stunning beach house —a kitchen of granite and fine custom cabinetry; appliances like Sub Zero, Wolf, Bosch and Asko; wood trim details like wainscotings, crown moldings and solid doors; useful technology like distributed stereo, video, Internet and security; an elevator and automated irrigation. Sound construction and craftsmanship throughout for lasting beauty and value—sided in low maintenance HardiPlank; outdoors, stainless steel nails and screws are used to fasten; 2”X6” exterior stud walls; brick lattice foundation; 10 ft. and 9 ft. ceilings; tankless water heaters; and many more details refined from years of beach front construction experience. Life sweetened by the breeze... secure…enhanced by luxury… all by thoughtful design. Sweet Breeze on Pawleys Island… a special beach home, a special place, a special island.